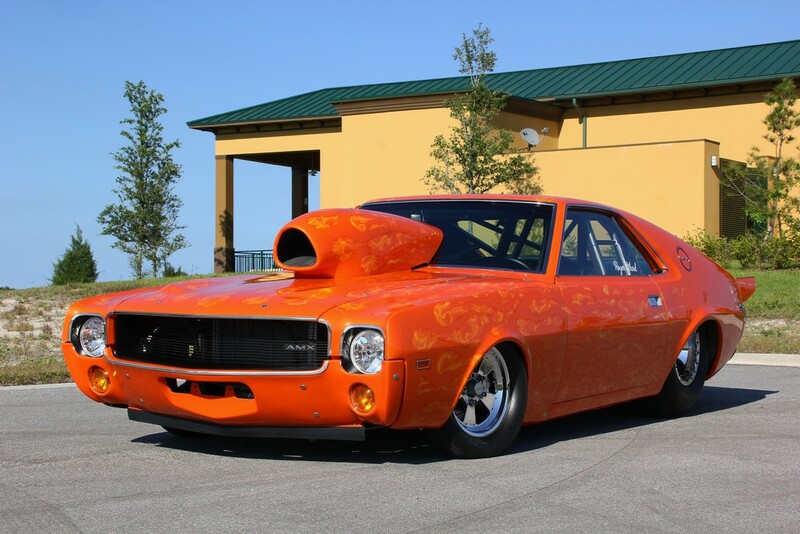 Click Here to Begin Slideshow Roger and Paula Ward of Mims, Fla. own this 1969 AMX. In 1965, the American Motors Corporation (AMC) developed a concept vehicle and coded it the "American Motors eXperimental," hence AMX. Its appearance was a big hit on the '66 car show circuit, and it was produced for the 68-70 model years as a two-seat GT-Styled sports car. 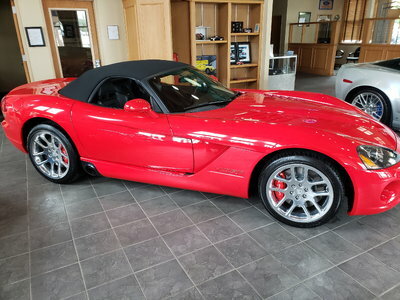 Also classified as a muscle car, but unique among other American cars of its time due to its short wheelbase (1 inch shorter than the fiberglass Corvette), it was the only American-built steel-bodied two-seater of its time, the first since the 55-57 Ford Thunderbird. 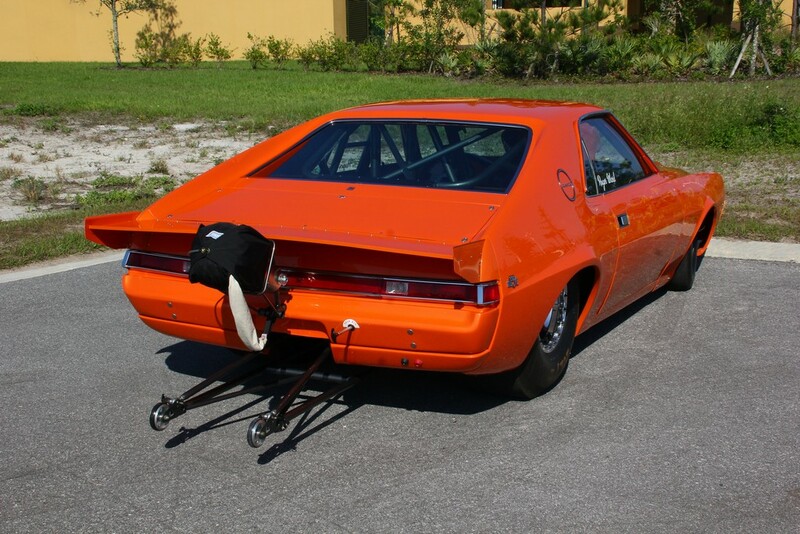 Rogers '69 AMX was built to replace another '68 AMX show and shine drag car (390 powered) that was destroyed in a drag racing incident on a local track in Florida. He is an AMC Purist, as he also owns a '69 SC Rambler (Scrambler), and a 68 AMX Show and Shine drag car powered by a beefed up 390 w/727 Torque-flight transmission that runs 11.20's (1/4 mile). Getting the picture? 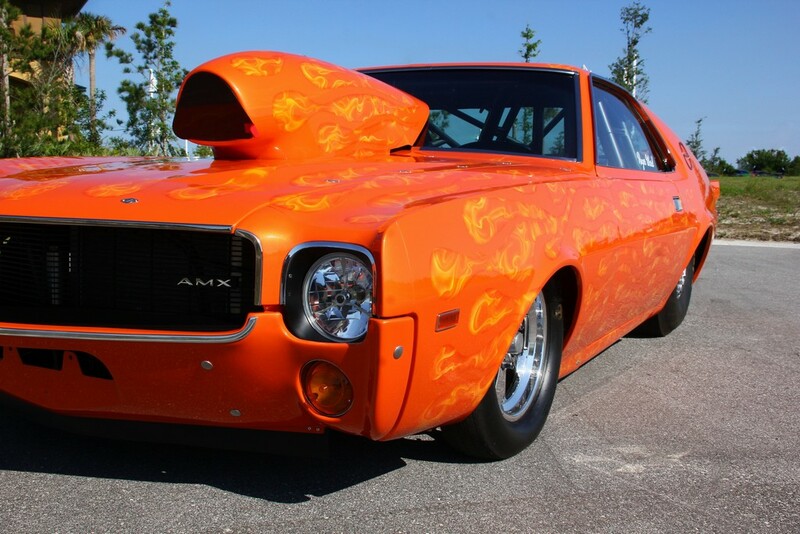 He LOVES AMC vehicles, and this most recently completed '69 AMX is the best yet! 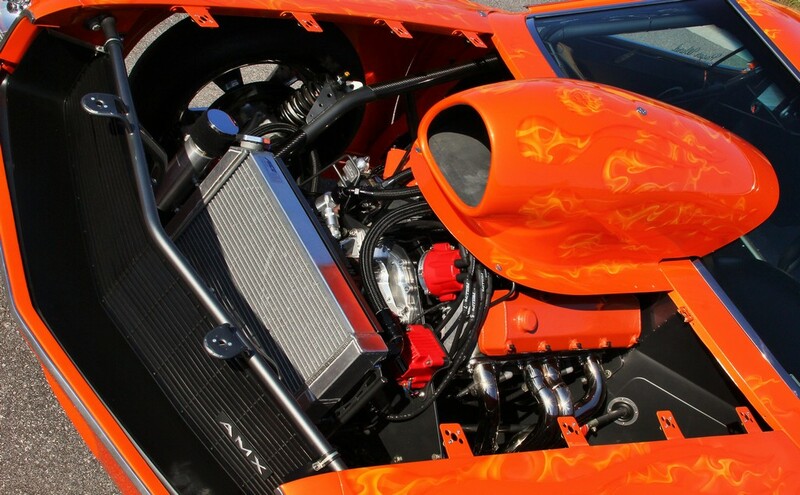 It built to run on the NHRA 9.90 index at Orlando Speed World nearby. 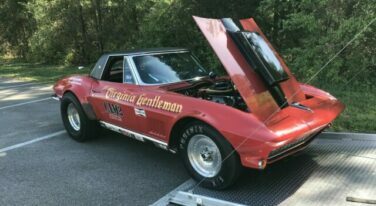 He has been running drag cars for over 20 years now and collected many a trophy with wins in the "show and shine," as well as many track wins. Roger works for the US Navy through Lockheed Martin on their D5 Missile Systems as a missile mechanic for the Trident Submarine. Now, you need to be pretty darn smart to do that work, and you'd better be detail-minded too, as these things aren't too forgiving! 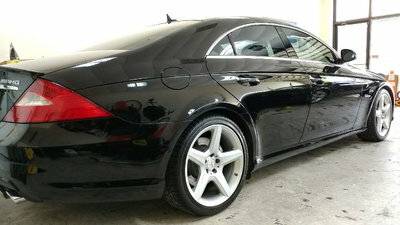 This is where you see where he is coming from on this car; it's well put together, with a lot of detail and engineering. True to form for Roger, too, is the fact that it's AMC powered! 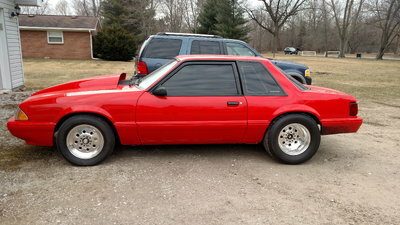 It would have been a lot cheaper to go Chevy or Ford, powered but he choose to go with the AMC 401cu in motor, stroked to 426cu in (expensive, he says with a laugh!). It has a custom crankshaft and a Pro System 1100cfm carburetor (no nitrous) with Indy Cylinder heads. 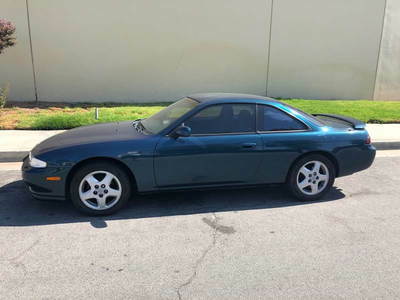 Its transmission is a FTI unit with Aerospace Shifter and 6200 Stahl converter, transmitting the power through a Strange 40 spline Chassis engineered rear end out of West Palm Beach. 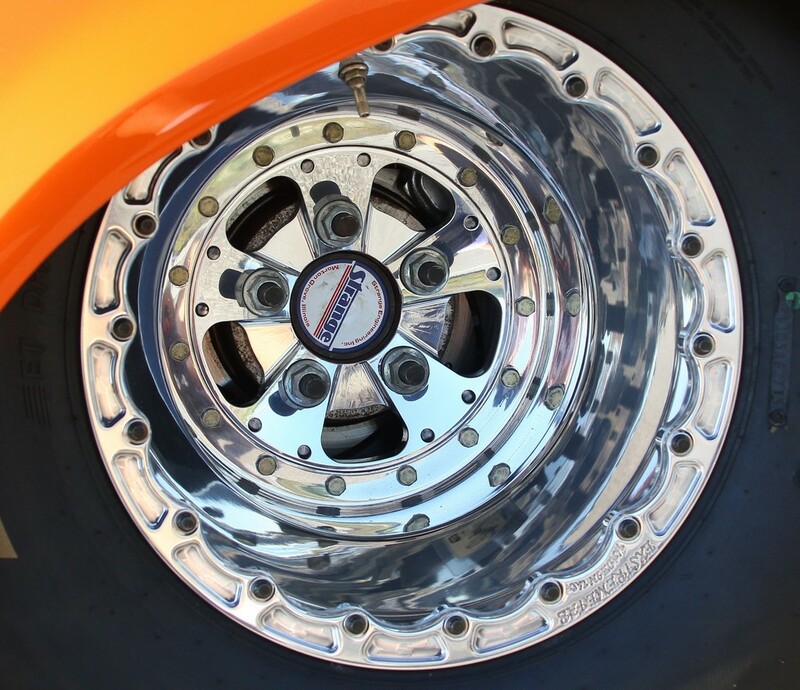 4:88 gears spins those massive Mickey Thompson 33x10.5x15 rear slicks on American Racing wheels all around, with 25x4.5 MT fronts. 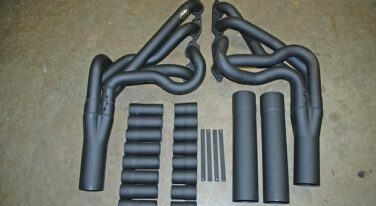 A 5 gallon fuel cell, hydro-dipped by Dip Master, stores the go-juice. With all that power, you still have to get her stopped, and this is done to the tune of Strange 4 wheel disc brakes and a Stroud parachute. 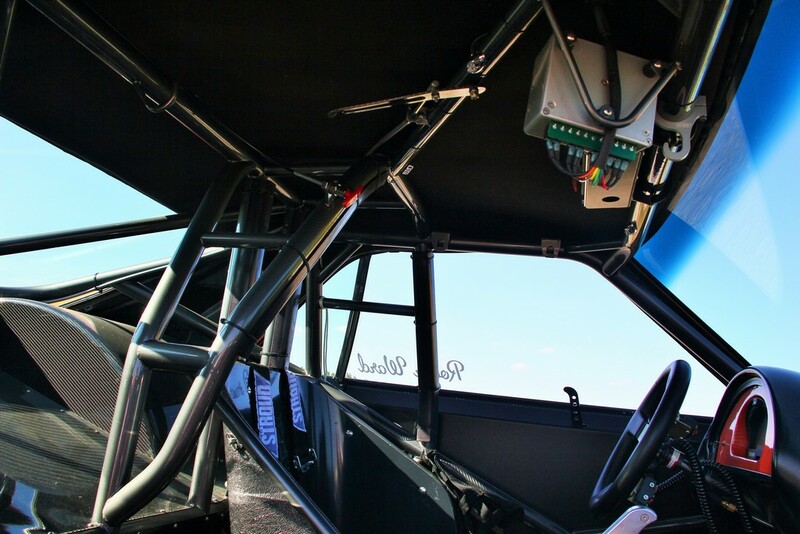 It takes a team to build such a car, and many thanks go out to Coast Chassis Engineering (Tim Christ), who built the full cage (a chrome molly funny car cage "Halo style") and chassis. 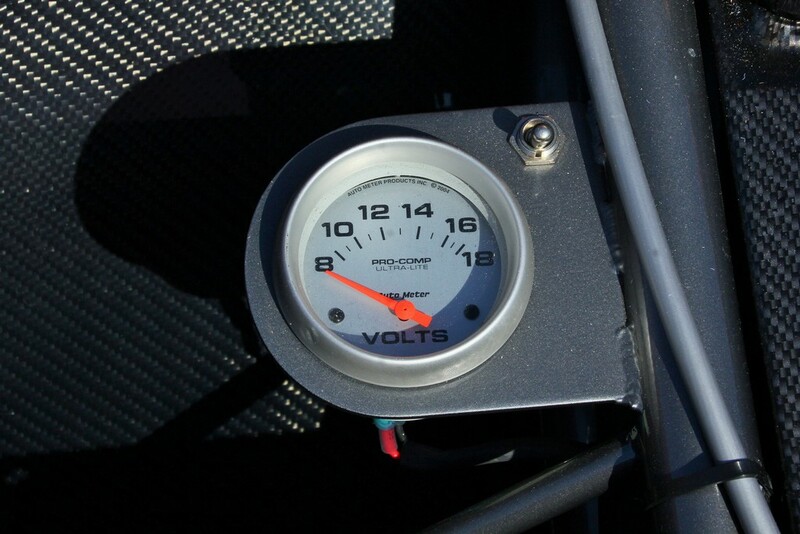 Also, Dave Hartman of Heartbeat Racing in Mount Dora built the motor, which is monitored by a Race Pac dash cluster. 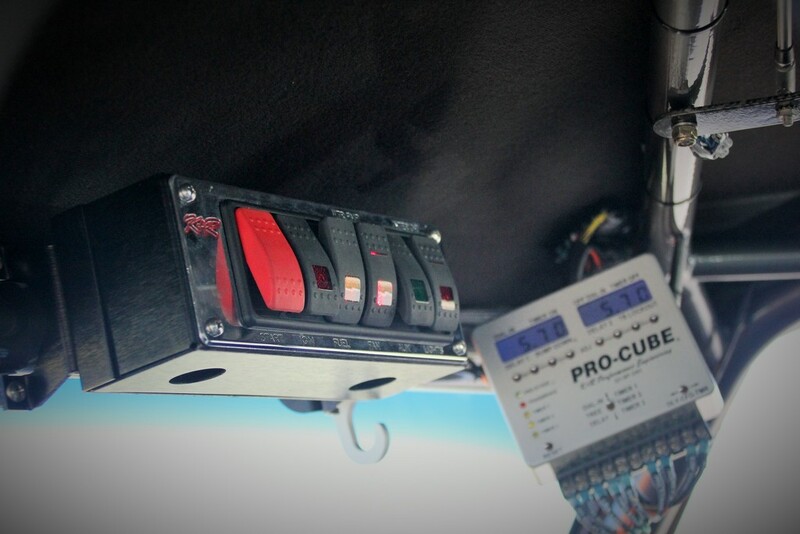 A Pro Cube K&R delay box handles the throttle stop and shifting duties while an aluminum radiator keeps it cool. 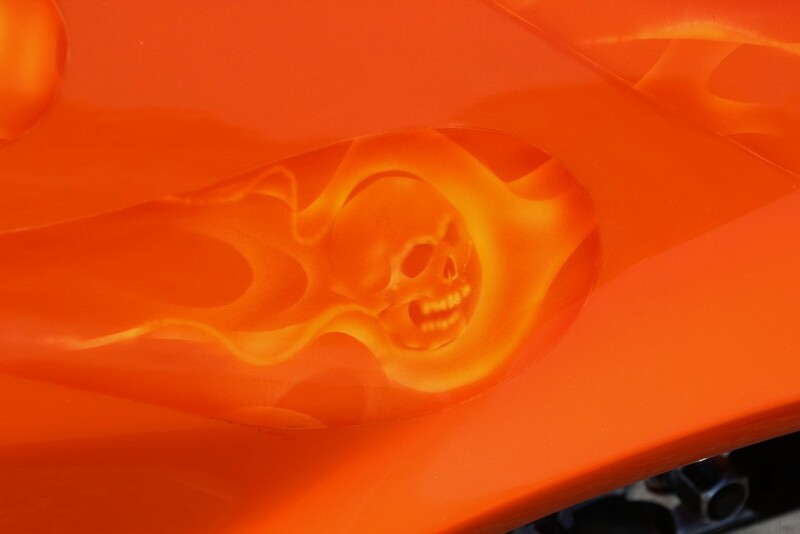 The paint, including ghost flames, was handled by GRP Auto Body, Inc and Miguel Rodriquez of Sarasota, Fl. Of course, Roger isn't in this alone; his wife of nearly 40 years has been by his side through thick and thin, right there when he was sliding down the 1320 upside down almost 1,000 ft on his roof! Another racer lost control in the next lane, clipping him from the rear and sending his former '68 AMX on its roof, totally destroying the car save for the little rear window valance used on this car. Orange Crush is steel except for the front fenders, hood, both bumpers and the hood scoop. We hope to be there when he gets it all dialed in and makes those passes down the 1320 soon enough. As their nickname implies, and the logo of Orange Crush, for "over 100 years CRUSH is still a favorite- there's a CRUSH for everyone" (wikipedia); this Orange Crush suits us to perfection! 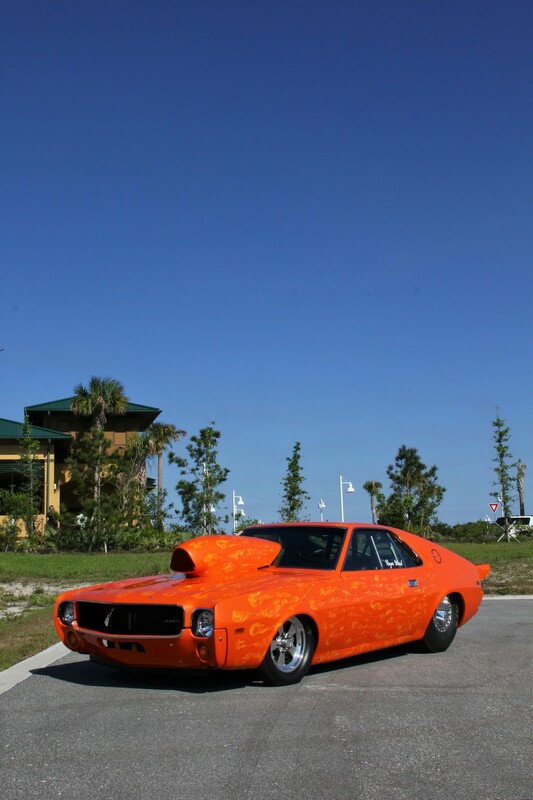 Roger and Paula Ward of Mims, Fla. own this 1969 AMX. 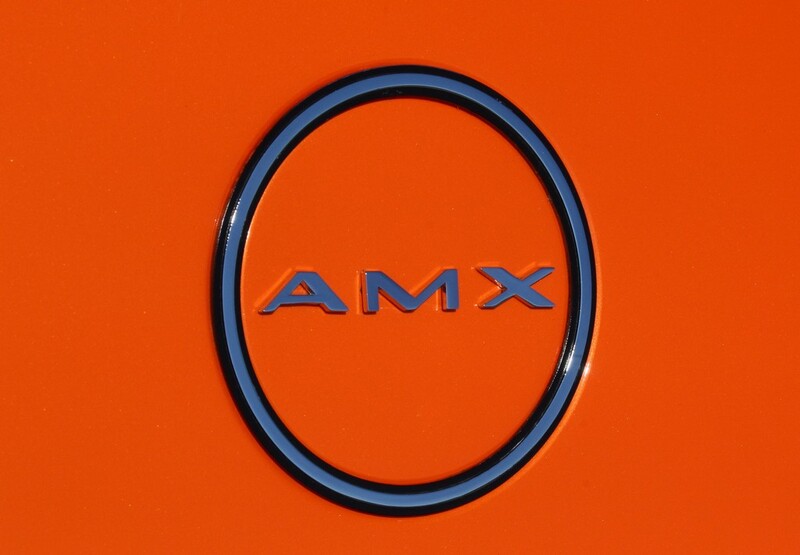 In 1965, the American Motors Corporation (AMC) developed a concept vehicle and coded it the "American Motors eXperimental," hence AMX. Its appearance was a big hit on the '66 car show circuit, and it was produced for the 68-70 model years as a two-seat GT-Styled sports car. Also classified as a muscle car, but unique among other American cars of its time due to its short wheelbase (1 inch shorter than the fiberglass Corvette), it was the only American-built steel-bodied two-seater of its time, the first since the 55-57 Ford Thunderbird. Rogers '69 AMX was built to replace another '68 AMX show and shine drag car (390 powered) that was destroyed in a drag racing incident on a local track in Florida. He is an AMC Purist, as he also owns a '69 SC Rambler (Scrambler), and a 68 AMX Show and Shine drag car powered by a beefed up 390 w/727 Torque-flight transmission that runs 11.20's (1/4 mile). Getting the picture? 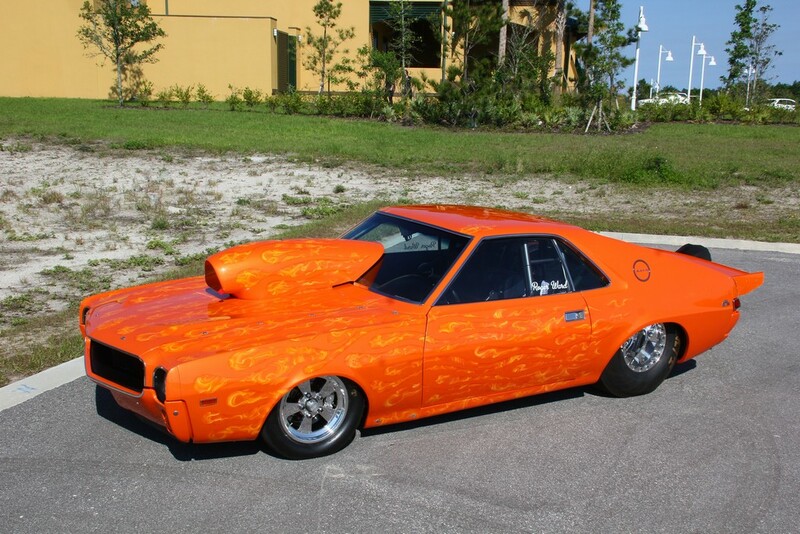 He LOVES AMC vehicles, and this most recently completed '69 AMX is the best yet! 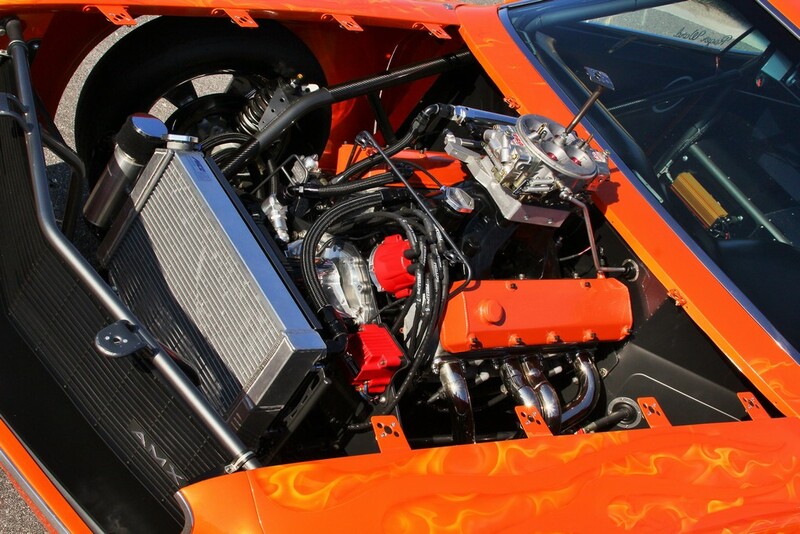 It built to run on the NHRA 9.90 index at Orlando Speed World nearby. 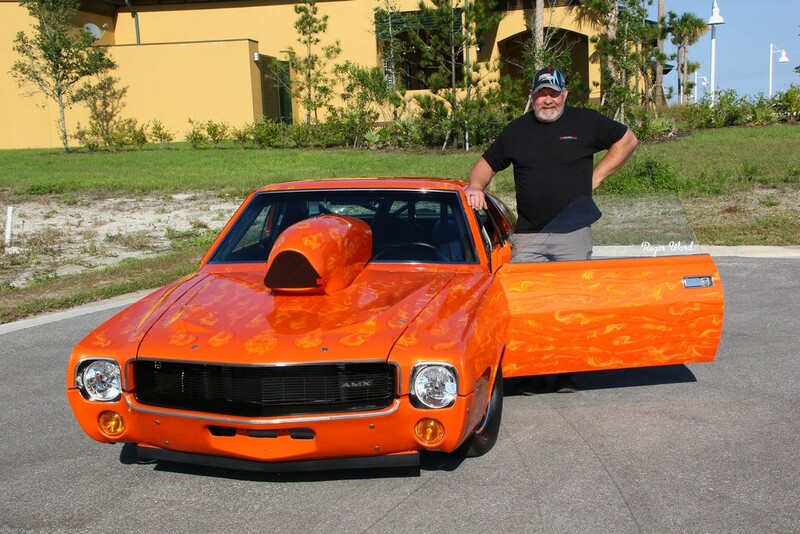 He has been running drag cars for over 20 years now and collected many a trophy with wins in the "show and shine," as well as many track wins. Roger works for the US Navy through Lockheed Martin on their D5 Missile Systems as a missile mechanic for the Trident Submarine. Now, you need to be pretty darn smart to do that work, and you'd better be detail-minded too, as these things aren't too forgiving! 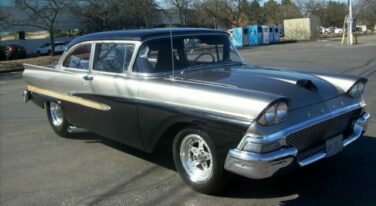 This is where you see where he is coming from on this car; it's well put together, with a lot of detail and engineering. True to form for Roger, too, is the fact that it's AMC powered! It would have been a lot cheaper to go Chevy or Ford, powered but he choose to go with the AMC 401cu in motor, stroked to 426cu in (expensive, he says with a laugh!). 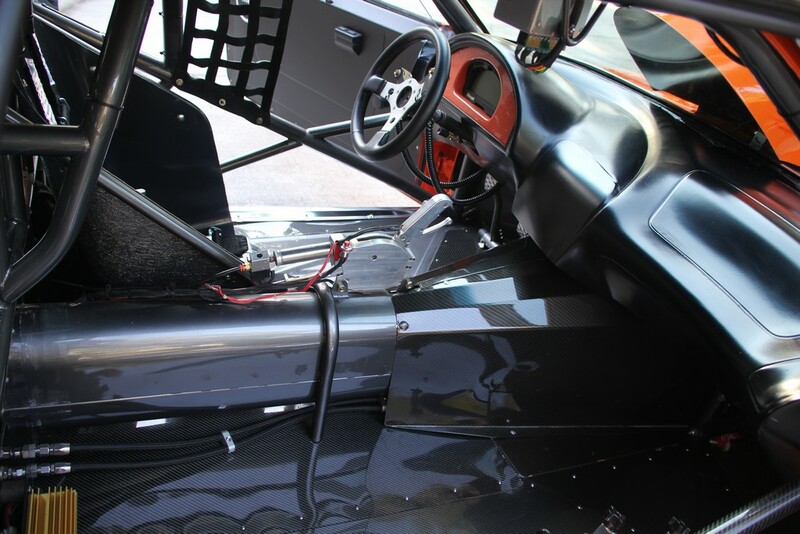 It has a custom crankshaft and a Pro System 1100cfm carburetor (no nitrous) with Indy Cylinder heads. 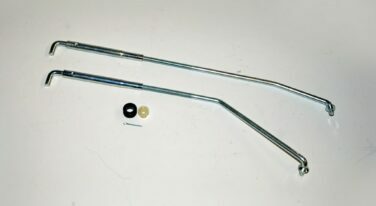 Its transmission is a FTI unit with Aerospace Shifter and 6200 Stahl converter, transmitting the power through a Strange 40 spline Chassis engineered rear end out of West Palm Beach. 4:88 gears spins those massive Mickey Thompson 33x10.5x15 rear slicks on American Racing wheels all around, with 25x4.5 MT fronts. 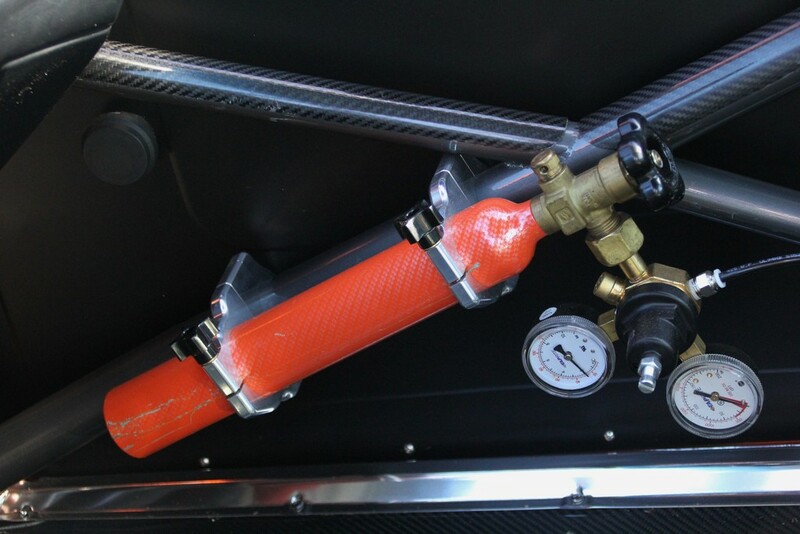 A 5 gallon fuel cell, hydro-dipped by Dip Master, stores the go-juice. With all that power, you still have to get her stopped, and this is done to the tune of Strange 4 wheel disc brakes and a Stroud parachute. 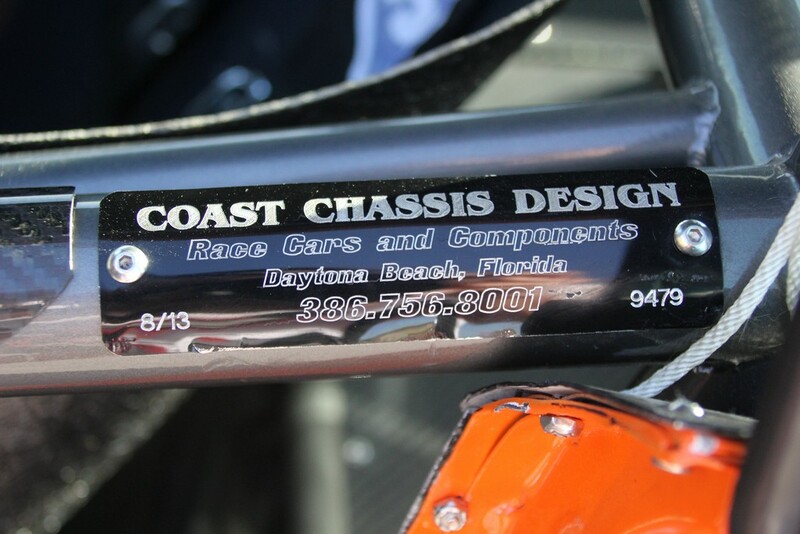 It takes a team to build such a car, and many thanks go out to Coast Chassis Engineering (Tim Christ), who built the full cage (a chrome molly funny car cage "Halo style") and chassis. 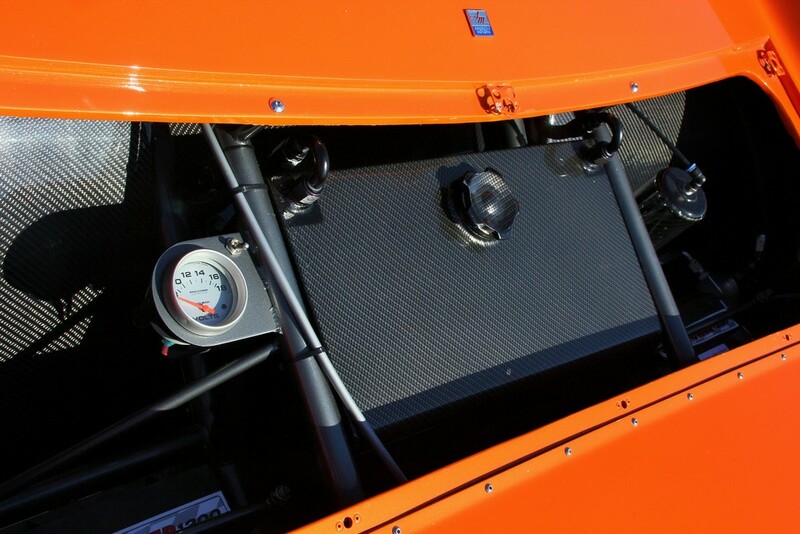 Also, Dave Hartman of Heartbeat Racing in Mount Dora built the motor, which is monitored by a Race Pac dash cluster. 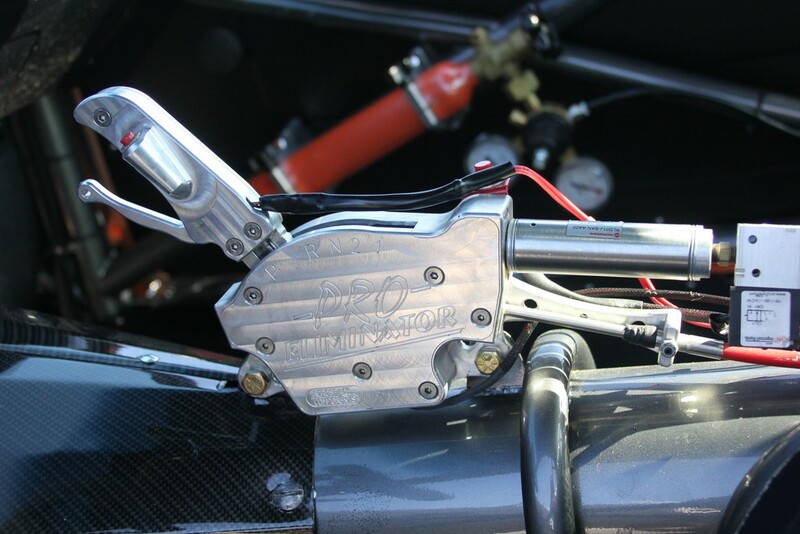 A Pro Cube K&R delay box handles the throttle stop and shifting duties while an aluminum radiator keeps it cool. 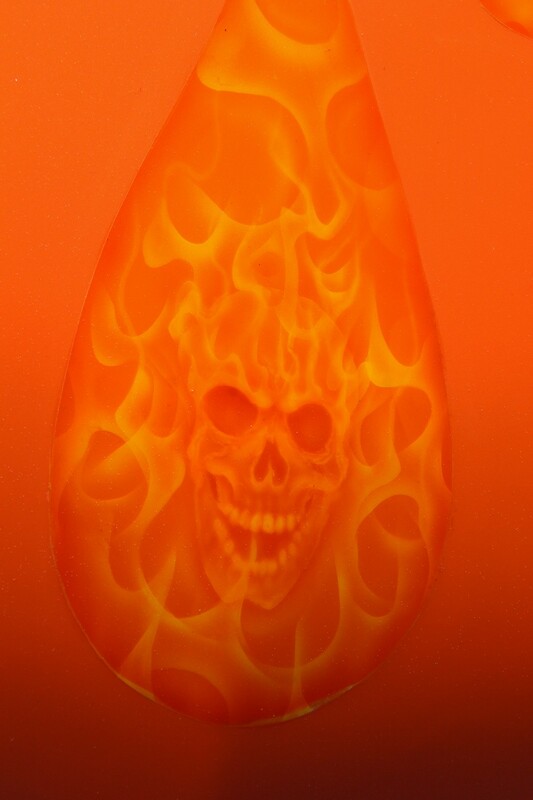 The paint, including ghost flames, was handled by GRP Auto Body, Inc and Miguel Rodriquez of Sarasota, Fl. Of course, Roger isn't in this alone; his wife of nearly 40 years has been by his side through thick and thin, right there when he was sliding down the 1320 upside down almost 1,000 ft on his roof! Another racer lost control in the next lane, clipping him from the rear and sending his former '68 AMX on its roof, totally destroying the car save for the little rear window valance used on this car. 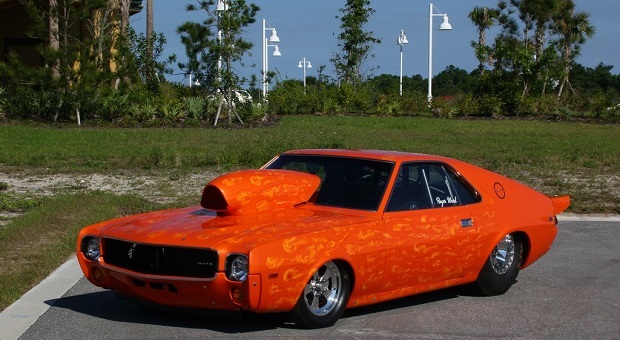 Orange Crush is steel except for the front fenders, hood, both bumpers and the hood scoop. We hope to be there when he gets it all dialed in and makes those passes down the 1320 soon enough. As their nickname implies, and the logo of Orange Crush, for "over 100 years CRUSH is still a favorite- there's a CRUSH for everyone" (wikipedia); this Orange Crush suits us to perfection! Great article. Damn that is cool! 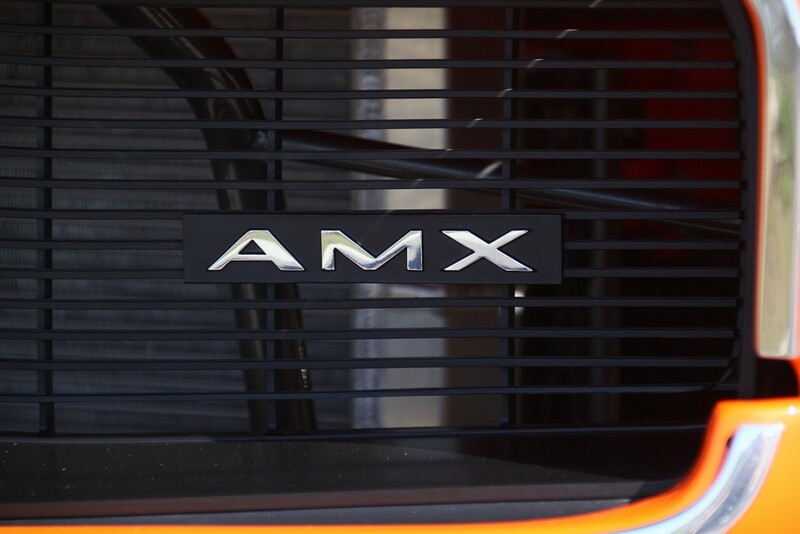 The AMX always has an advantage at the track with that shorter wheelbase as it doesn’t have to launch out of that same chewed up contact patch that all the A-bodies launch from. My 70 AMX Go-Pack X code car is my most favorite car in my collection. 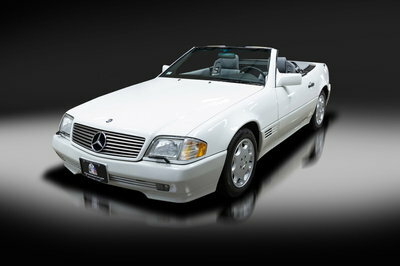 Outstanding rendition of this timeless classic, AMC 401 power is the cherry on the sunday ! 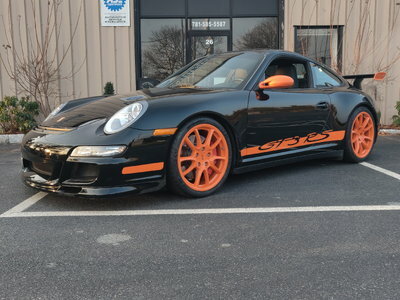 Oooooh how much I need something like this for my daily commute to work.